Lappeenranta wants to be a model city for sustainable activities. Lappeenranta has chosen a philosophy and approach, which aims at a green future – greenreality. It arises from responsible choices, ecological thinking and green research. Cooperation between the city, its university and companies has elevated Lappeenranta into one of the leading ‘Earth Hour’ capitals of the world. Lappeenranta is working to achieve a more sustainable future. The WWF has, for the second time, selected Lappeenranta as a National Earth Hour Capital. “We want to be a model city for sustainable activities. Our objective is to be energy self-sufficient, and a waste-free city in the future”, says Lappeenranta’s Development Manager Markku Heinonen. The Lappeenranta University of Technology is internationally renowned for its expertise in energy and environmental technology. The university and companies are cooperating with each other, and the city is also striving to create ideal conditions. “We wanted to do everything to completion. The university’s efforts have also gone beyond simply “the study” of potential, meaning that many innovations are being brought forward towards implementation, together with companies”, Heinonen tells us. A good example of one cooperation is the project carried out together with Wimao and Kompotek, involving the construction of a pilot plant connected with regional waste management. The plant is able to process different recyclable materials that can be manufactured into bio-composite products. “This pilot plant is the first of its kind in the world. The project strengthens the circular economy and in the future, will put landfill waste volumes under control”, says Ville Immonen, the Managing Director of Wimao. The city and local entrepreneurs are welcoming new cooperation partners to take part in the activities. “We are actively looking for new cooperation partners and we are facing new ideas with eagerness”, says Immonen. As an export industry city, Lappeenranta Airport has its sights set on direct flight connections to Europe and, maybe, Asia. With regard to leisure flights, the airport has been popular – especially among travellers from St. Petersburg. 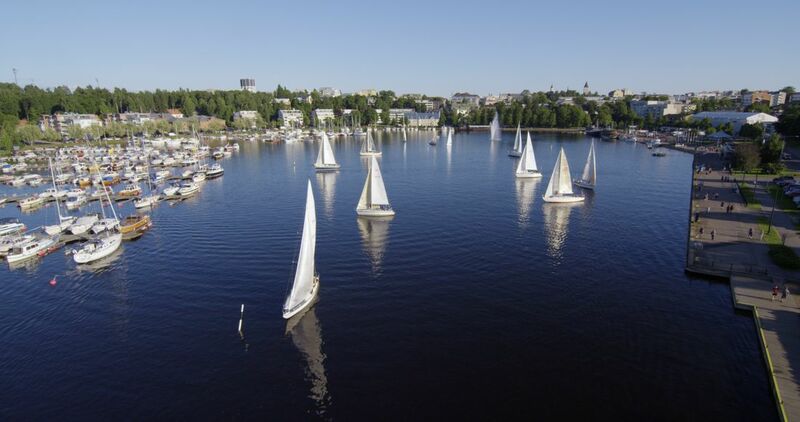 The City of Lappeenranta wants to make a concentrated effort to advance Finland’s implementation of the business opportunities offered by the Paris climate agreement. Along with the state’s growth agreement process, companies are being offered cutting-edge research and piloting environments in the environmental business sector. “Interesting targets can be found, for instance, in the storage of renewable energy, production of new fuels, intelligent steering of consumption, handling of sludge, and recycling of nutrients”, describes Heinonen.